From 2016, water main replacement projects will start or continue work in the areas below. We will notify residents and businesses in these areas before any work takes place. Most work hours will take place from Monday to Friday, 6.30am to 5.30pm and Saturday, 8am to 2pm, however some night work may be required. All work is subject to site conditions and weather. We work closely with construction contractors to make sure there is minimal impact to residents and businesses in the area. Communication activities will be in place before works start. We work closely with construction contractors and make every effort to minimise impact to the community. Driveway access - some work may cut across driveways, however, in most cases driveway access will not be affected. Traffic disruptions - there may be minor disruptions around work sites, with electronic signage and/or traffic management on site during project work hours. Noise and dust disturbances - there may be construction noise and dust associated with excavation and work vehicles accessing the sites during project work hours. Access restrictions - some footpath access and on-street parking may be temporarily unavailable. Temporary water shutdowns - for some customers there may be interruption to supply while the new water main is connected to the existing system. Dialysis patients - Queensland Health will be notified at least 48 hours before any temporary water shutdowns. We are committed to ensuring the long-term sustainability and efficiency of the region's water and sewerage. 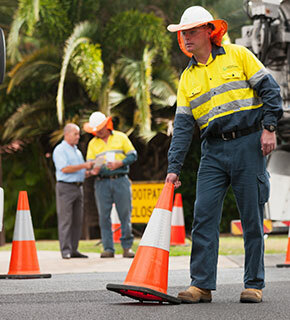 As part of this commitment, we are rolling out the Water Main Replacement Program (WMRP) across Brisbane, to improve the reliability and the integrity of the water network. Work involves replacing sections of existing water main pipes. A property doorknock if driveway access is to be affected. A Construction Work in Your Area notification postcard is delivered to each affected property. A Temporary Water Shutdown notification postcard is delivered when the new water main is due to be connected to the existing system. Community engagement is carried out as required. The local Councillor and ward office is notified. Notification of timeframes and maps of the work footprint will be sent to Queensland Health and Queensland Fire and Rescue Services before any changes occur to the water supply.